Ragini Murarka credits her graduate education at NC State with opening up career opportunities. Photo by Marc Hall. Redwood trees are famous for their age – thousands of years old, they stand tall and majestic. But for NC State alumna and donor Ragini Murarka, the trees also demonstrate an important lesson. “Their roots are very shallow. It is amazing that they survive earthquakes and storms with such shallow root systems,” Murarka said. What enables the redwoods to thrive, she explained, is the network of roots, spreading out and supporting one another, helping younger trees catch hold. Murarka, who earned her master’s in physics in 1972, believes in the power of such a network. She came to NC State in 1970 from St. Xavier’s College in India, after a brief enrollment at Columbia University in New York. The support of a teaching assistantship and a more affordable cost of living made transferring to NC State the right choice for her. Her brother, the only person she knew in Raleigh, moved shortly after she arrived, leaving her on her own in a new place. The supportive connections of her network set Murarka up for success. As she undertook a thesis in semiconductor physics, she became the first graduate student of professor and researcher Jan F. Schetzina, which she calls “quite an honor.” Schetzina’s accomplishments include developing a prototype of the first digital camera that senses only ultraviolet light and being selected as the site for a laboratory visit from then-President George H.W. Bush. Supporting higher education brings opportunity. Murarka was encouraged to pursue her Ph.D. but remembers seeing news reports of bleak job prospects for students with doctorates in physics. Instead, she focused her attention on an up-and-coming technology: computers. 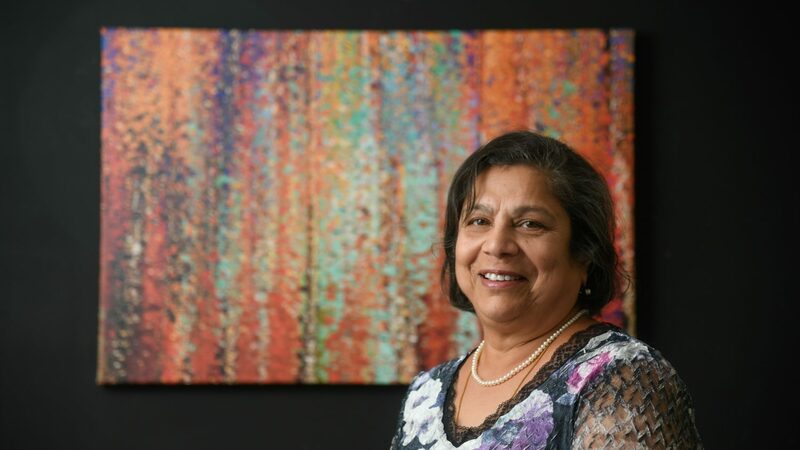 Murarka moved to New York in 1973 with her husband, Ishwar, a postdoc in the Department of Statistics. The pair had met in an elevator his first day at NC State and reconnected when he responded to an ad to purchase furniture she was selling. She secured a job doing modeling software, thanks in part to her background in physics. She noted that her first supervisor was impressed with her analytical and computer skills and her ability to deliver presentations. Over the course of her career, Murarka built on the knowledge of computers and physics she honed at NC State. In the 1980s, while working for a small company that was eventually purchased by Hewlett Packard, she developed software for the semiconductor manufacturing industry that tracked wafers – thin slices of semiconductor material that power the integrated circuits found in many electronic devices – through the manufacturing process and collected engineering data. The software, which capitalized on her semiconductor physics knowledge and computer expertise, has been used worldwide by companies such as Intel, AMD, Sony and Mitsubishi. Having experienced what a graduate degree can make possible, Murarka decided to pursue an MBA at Santa Clara University and transfer from software engineering at HP to marketing. Today, she serves on the board of Ekal Vidyalaya, a non-profit organization that creates and runs schools in India, and presides over the Sameer Ishwar Murarka Memorial Foundation established in memory of her younger son, Sameer. Recently, Murarka has decided to give back to the institution that helped launch her career by establishing an award endowment to support NC State graduate students in physics, particularly those who are traditionally underrepresented in the discipline. She was inspired by her husband, who did the same at his graduate alma mater, Oregon State University. Having been welcomed by professors and peers at the university and benefited from the investment made in her, Murarka is ready to bring other emerging physicists into the network. She hopes to grow the Ragini Shah Murarka Graduate Student Award Endowment in the coming years, knowing what a difference such support can make for students pursuing their dreams. She and her husband receive thank-you letters from students who benefit from a scholarship established in her son’s memory at California State University.